Abstract: The Gelid Tranquillo 4 is built around four 16mm diameter copper heatpipes, a stack of ~40 nickel plated aluminum fins and a very unremarkable 1600rpm, 120mm PWM fan. The heatsink makes use of 'exposed heatpipe base' thermal design. Intel Core i7, Extreme Edition class heatsinks tested at a 200W heat load. Results based on readings from a 38x38mm copper interface die with 200W heat load on the Intel version of the Mk.III Test Platform. Temperature results listed for each heatsink were calculated by determining the rise over ambient temperatures at time of test. Information on Frostytech's test methodology is available here. *Heatsinks are ranked according to the 200W Thermal Test results column (rise over ambient temp.). Low temperatures with low noise levels are considered best. For reference heatsinks with variable-speed fans, only the high speed (12V) fan test result is included in the comparison sheet; more detailed results reside in each specific heatsink review. Frostytech's socket LGA2011 Intel synthetic thermal test platform stresses socket LGA2011/1366 compatible heatsinks with a 200W heat load. Keep in mind that the AMD Integrated Heat Spreader and Intel LGA2011 Integrated Heat Spreader both measure ~38x38mm, so these test results can be extrapolated to AMD processor scenario's as well. With a 200W heat load applied by the Intel LGA1366 version of FrostyTech's synthetic thermal test platform, the Gelid Tranquillo 4 heatsink yields a temperature result of 22.4°C over ambient at stock fan speed (1600RPM / 46.9dBA). Reducing fan speed to 750RPM drops noise output to 39.2dBA while increasing test temperatures to a satisfactory 33.5°C over ambient. Bottom line, the Gelid Tranquillo 4 is a good mainstream cooler for sub-200W TDP processors. It's not the coolest air cooler around, but it's also not massive in size. It's not the quietest heatsink we've come across, but it makes due well enough with a single 120mm fan that's easier to fit in computers than 140mm fans are. Lack of LGA2011 support and absence of the manufacturer addressing Socket AM4 brackets (the Tranquillo 4 was released before AMD Ryzen was announced) is a bit of a problem... The Gelid Tranquillo 4 heatsink is more than adequate as a budget air-cooled heatsink for the Intel LGA115x and AMD processor platforms. The Top 5 best heatsinks for low noise and low temperature are ranked here. 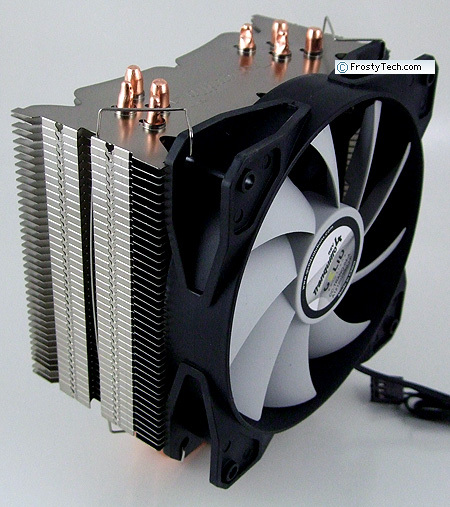 For more reviews on the latest heatsinks and cooling solutions, rely on FrostyTech's inventory of 400+ heatsink reviews. Here are a few other articles that you might enjoy as well. List all Gelid heat sinks that Frostytech tested?